Our new web site is ready to be unleashed on the world!!! Very shortly, you will get an email with your new user ID and password. Please log into the site and take a look around. Major features of the site are: The site has both public content and members-only content. You have to log in with your user id and password to see the members-only content. Each club committee head (racing, safety, social, etc) will have his/her own web page and blog for posting news and articles. All club events will be visible on the main calendar, AND on the activity-specific page. For example, club social events will be shown on the main club calendar and on the social page. We have a direct link to our Facebook page from our web site. The ice chest code is listed on the members-only section for easy reference. So, don’t feel guilty about locking the chest after you get your ice. Club members can post their own classified ads for buy/sell notices. Club members can post comments to our general forum. Racing members can post open crew positions. A photo gallery page for adding photo albums for club events. Ships Store catalog online. A contacts page to send emails to various committee heads. Past Telltales and past racing results. A separate page for each fleet. A new Cruising section for you cruisers to organize events. We have moved most of the content from the current site and will be rolling out additional content as the year goes by. Any suggestions for content can be sent to publicity (use the contacts page on the new site). Any disparaging remarks should only be made by those who wish to be Publicity Chair next year!!! Geoff Other Miscellaneous Now that you have your boat in the water, please remember to coil your dock lines. We don’t want anyone to trip and have a serious accident. Also, as always – please be sure to lock the gate at dusk whether you are the last one out or not. This means that you should always have your gate key with you when you are at the club. Welcome to three new members in the month of March. All three have asked to be placed on the wait list for a wet slip. If any member already assigned a slip might wish to sublease, please contact Assistant Harbormaster, Dennis Robertson. Karen and Ken Orndorff of Indianapolis. No boat at present Gordon and Susan Perry of Lebanon, sailing a S2 6.9 Steven Gummer of Indianapolis with a Hunter 212 Our first New Member Orientation will be held in the upper shelter house on Sunday, April 17th at 1:00. Come to meet with Christy, learn more about the club and to meet each other. Spring is rolling right along. Water has been turned on so boat clean-up can begin. ECSC had great work day last Saturday with much accomplished and another work day is planned for this next Saturday, April 2nd 8:30 am. All decals and keys have been mailed to those of you who have paid-in-full. Our Harbormaster has announced that trailers may be taken to the upper storage area beginning 4/1, but ALL MUST HAVE 2016 DECALS on the port side of the trailer – no exceptions. Dennis and Jenipher have put the 2016 decals on the docks so members with newly assigned slips should have no trouble finding where to put their boat. Boats are being launched as we speak. This wonderful weather will see boats in the water early this season. So we are off to a great season at ECSC. See you all at the Mother’s Day Brunch on Sunday May 8th 11:30. The ECSC Junior Sailing Camp which is scheduled for the weeks of June 20-24 and June 27-July 1 is filling up quickly! We care currently sitting with about 2/3 of the spots filled. If you are thinking of having of having someone you know attend the camp, now is the time to print off the on-line registration form and get it sent in to be sure you have a spot. If you are a club member and know someone who might enjoy the camp, be sure to talk to them and their parents about it. The camp is a great way to get families exposed to the sport of sailing and also get new members in our club. Register here! Register here! The ECSC Junior team will be starting their season with a Laser regatta at ISC this weekend! This regatta is always a good “warm up” for the juniors, although the weather is usually cold and windy. 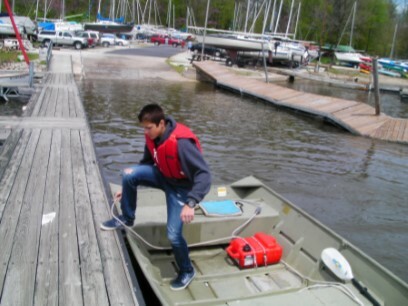 But it is good for them to get out on the water and check that they and their boats are ready for the summer competition season. We could all follow their lead and give our boats a good once over before the sailing season gets in full swing. Good luck ECSC Juniors!